The Learning Academy Partnership (multi academy trust) and Ellacombe Church of England Academy were delighted to welcome special guests, including The Right Reverend Nick McKinnel, Bishop of Plymouth, to the official opening of the brand new Little Stars Childcare Centre in Torquay on Thursday 31st January 2019. Little Stars was originally established by the Trust in September 2012 in a small, drafty church hall sited behind Christ Church Ellacombe, and was the first step for the Trust in working with preschool children. The following year, the nursery had their first Ofsted inspection and was rated Outstanding in every single category. Following the closure of Christ Church Ellacombe last year the Church of England Diocese generously gifted the Hall and Church building the Trust, to further support its mission to the community. The Learning Academy Partnership is a multi academy trust, consisting of eight schools whose mission is to provide an exceptional education that always puts children first so that all children flourish and life chances are transformed. The DfE performance tables comparing multi academy trusts across the country rated the Learning Academy Partnership as one of the top 10 performing Trusts nationally. Recognising the shortage of high quality nursery provision in Torquay, in 2017 the Trust secured £800,000k funding from the Department for Education and the local authority, as well as making their own investment, to enable the creation of an amazing Childcare Centre for the local community and families. This funding enabled the old church hall to be fully refurbished and extended to provide a state of the art purpose-built Nursery and Childcare Centre, offering a high quality provision to give the youngest children in the community the very best start in life. The variety of rooms offer a wide range of exciting and fun curriculum opportunities to engage all interests and support the unique development of every child. This includes top of the range IT facilities and resources to support all areas of learning. Mrs Atkinson, Chief Executive of the Trust, welcomed the guests, all of whom had been involved in the project in some way, including: Torbay Early Years and Local Authority, Diocese of Exeter and local clergy, Torbay Development Agency, Kensington Taylor Architects, South West Highways, Ellacombe and Warberry Academies. After the welcome speech and thank you’s from Mrs Atkinson, The Venerable Douglas Dettmer, Archdeacon of Totnes, said: “This would not have happened without Mrs Atkinson’s leadership and vision and we all wish to express our thanks”. Guests were then invited to look around the nursery rooms upstairs, where the Bishop cut the ribbon and said: “It is wonderful to see this Childcare Centre now full of life and youth and promise and hope for children’s future.” This was followed by songs from the Ellacombe C of E Academy choir and refreshments. Little Stars Childcare Centre caters for nursery children aged 2 – 4 years old and provides free 15 hour and 30 hour nursery places available, as well as additional paid for sessions. Opening hours have been extended from 7.30am to 6.00pm weekdays, during term time, to provide wrap around care, with all year round care being facilitated through the Trust’s partnership nursery. To find out more please telephone 01803 293040 or email littlestars@lapsw.org. Little Stars Childcare Centre is just Phase 1 of a bigger community project, and the Church and the building will become an expression of how the Trust can serve the community and will be for people of all ages. 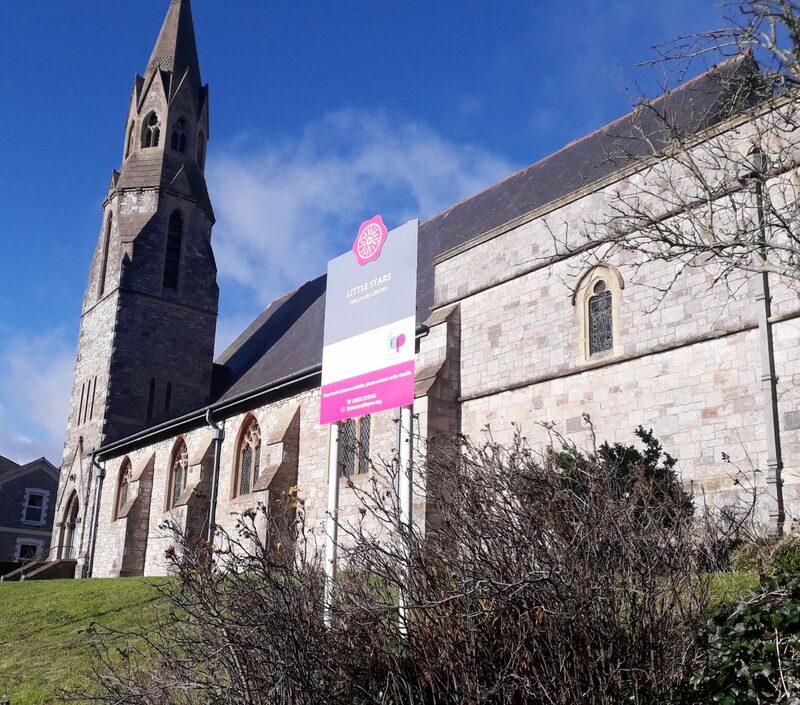 There will be a place of worship within the Church, as well as space where the community can come together, including community groups and services.